My name is Jose Antonio Cabrera A.K.A “Tony”. I was born in Cuba and lived there until the age of ten. My parents emigrated to this great country because of Communism. They were looking for the most precious commodity that any human can have—FREEDOM. After one year in college, I discovered my true passion in life—HAIR. I completed Beauty School and loved it from day one. My Mother, initially, had reservations about me becoming a hair stylist. She saw me open my own Salon, within two years of graduation. She could see that I was both happy and economically successful. She had to admit that it was the perfect choice for me. I am an animal lover to my soul, but I had never heard of purebred dog exhibition. Ten years after becoming a hairstylist, I discovered the wonderful world of dog shows. The first time that I went to a dog show—I was hooked. In some respects it was like my life went from black and white to TECHNICOLOR. Little did I know that my Pomeranians would take me all over the world. I have met wonderful people, from a variety of countries and cultures—some of whom I bonded with, and who have become more like family members than friends. No matter what language was spoken—we had one common denominator—a love and passion for animals. My greatest gift in life was my beloved Mother. The sport of dogs has been the best gift that I ever gave myself. Showing both dogs and cats has enhanced my life beyond all measure. Over the past 30 years, the Starfire Pomeranians have won 9 National Specialties—and too many Best in Shows to record. I am grateful to have a international demand for my Pomeranians. 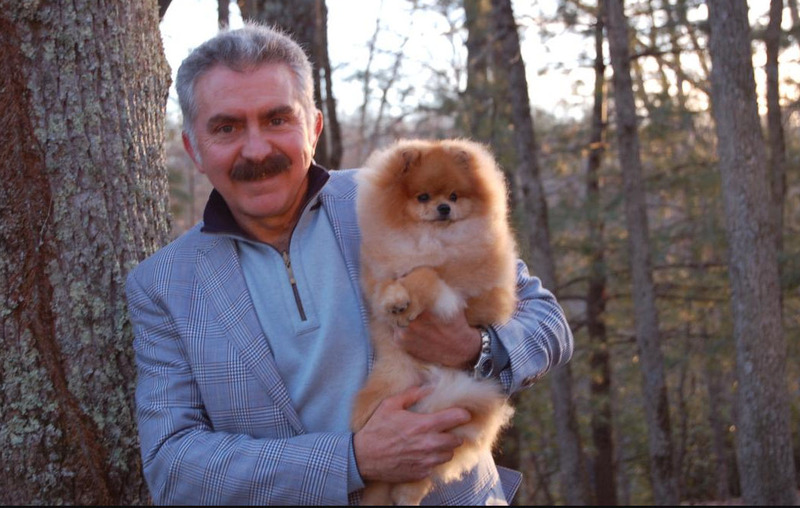 The highest accolade that I have received was in 2006, when along with my partner, Fabián Arienti, we were selected by the American Kennel Club as the Toy Breeders of the Year. I feel blessed by the awards, but my greatest reward has been the companionship of my wonderful dogs for the past three decades. When I walk in the door and see all the smiling Pomeranians racing towards me—I know one thing for certain—that I am loved. I believe that my passion for hair and the showing of both Pomeranians, Maltese and Persian show cats—has been my destiny. I am launching a wonderful new product line, which is the result of forty-one years of being involved, on a day-to-day basis with all aspects of hair—both human and canine. I have always used the BEST hair care products that have been available. I have, over time, developed some of my own products that have proven successful for both my dogs and my cats. The thought of establishing a line of premium hair care products has been in my mind for many years. I sold my salon a year ago. I am ready to share this line of products with the world. I feel that I have the equivalency of a Ph.D in hair. Yes, this is a business, but this business is not just about generating profit. It is also about offering products that will enhance the skin and coats of dogs and cats so that they will look like Best in Show exhibits. I think about and care about every aspect of animal health—their health, their training and their nourishment. On this web page, I will share my professional secrets each and every month. I will show you how to groom, condition, and prepare your animals for the show ring—and teach you how to restore their skin and coats back to health. I will also have little secrets about training your babies, evaluating them correctly, and enjoying their beauty, from the inside out, to their full capacity. This advanced curative collection is not just for the show dogs, but also for your companion pets, who are equally important in your life. I am most excited about my Starfire’s Curative Coat Care Line of hair products. This line embodies the idea of achieving beauty through wellness. It is a sulfate and sodium chloride free shampoos—gentle, yet effective. This line was designed be a restorative treatment proven to reverse damage and replenish hair. I want this web page to be your place on the web where you can find all you need to know to keep your pets looking beautiful while maintaining healthy skin. I will also be providing a wide variety of advanced training for Starfire’s curative haircare groomers via encouragement and mentoring. STARFIRE’S PRODUCT LINE HEALS, SEALS and PROTECTS and delivers Best in Show Hair Results—GUARANTEED.